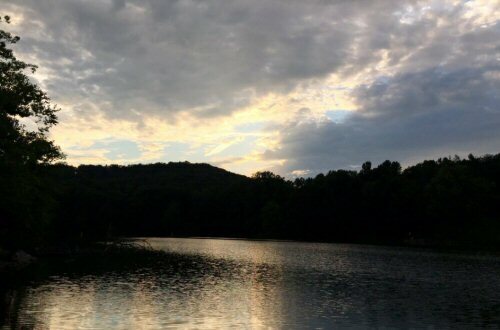 The 414 Acres of Hidden Hollow Ranch sits quietly in the foothills of Columbus Indiana. Tony’s home town. 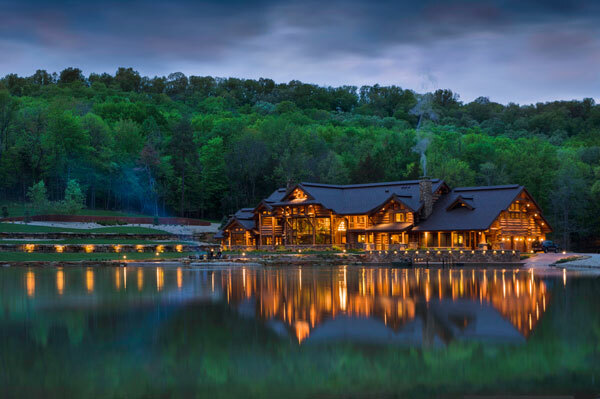 The estate sports a private lake and an extraordinary log home designed by Ellis Nunn & Associates Custom Luxury Homes. 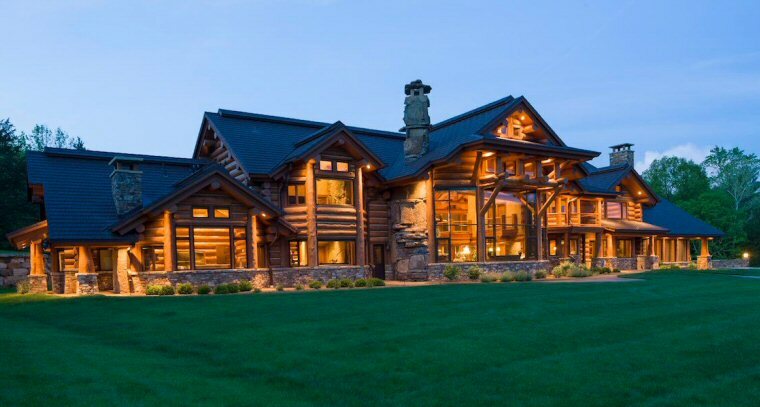 In August 2014 Log Home Living selected Hidden Hollow as it’s monthly Featured Home. In their article they list the property as 425 acres. After Tony’s win at Sonoma in 2016, he shared a Periscope event from Hidden Hollow, the Fireworks War (you can see this via a link below). In this Scope, Tony clearly says the property is 414 acres. The lake behind the house took most of 2005 to construct, long before the home building began. 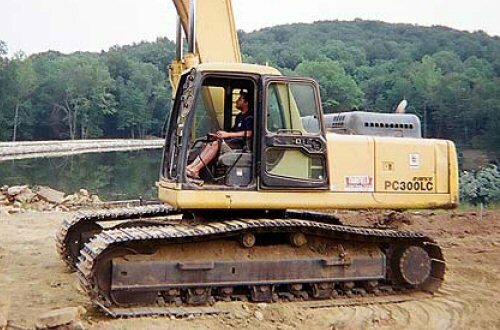 Man-made lakes need time to evolve into a healthy habitat for both fish and wildlife. 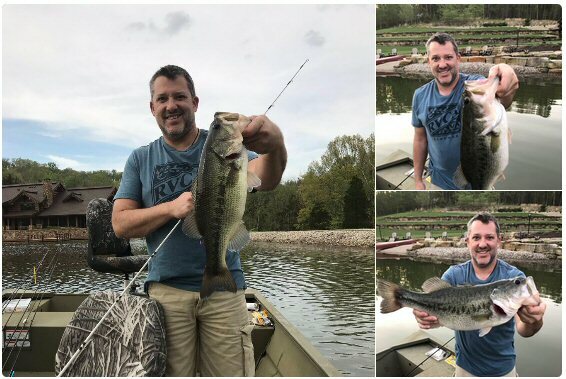 The Lake Project was featured in Pond Boss Magazine, who gave permission to the Bass Resource guide to reprint the article: Tony Stewart’s Lake Project. 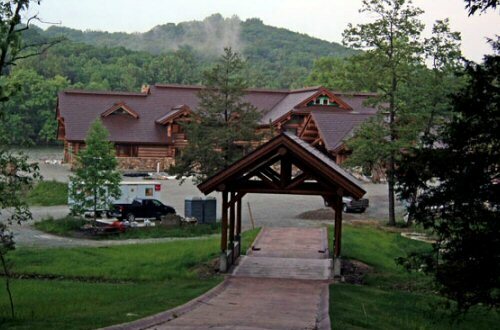 The article tells the tale of how BassPro Shop founder Johnny Morris helped his good friend Tony Stewart construct the lake and create the beautiful natural setting that complements the log home. This article reports the lake to be 8 to 10 acres, with an 800 foot dam. 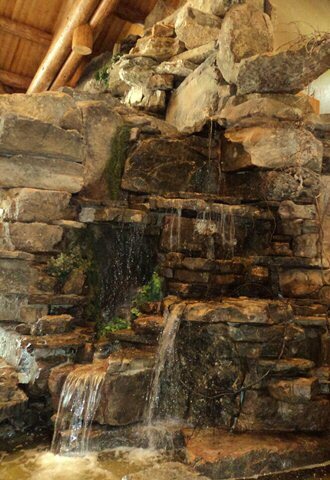 The Log House itself comes complete with indoor stream, fish tanks and wild life that decorate the natural stone rocks and waterfall. All I can say is…this is “my” dream home; well sort of. I probably wouldn’t hang an Indy car on the wall. Access into the property is gained through a large and lovely carved wooden gate. 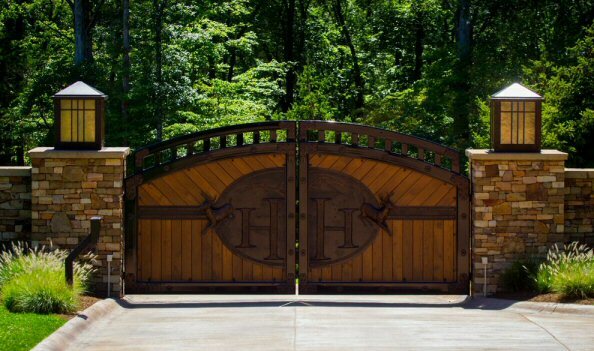 The double H on the gate stands for Hidden Hollow. From watching some of Tony’s Periscope videos, I believe there are two entrances into the property. What I’d call the main entrance is gained through this gate. The road travels up the hill and through the covered bridge to the front of the house. The second gate is gained from the back of the property and is similar to this one. The road from that gate also travels up the hill, but travels over the dam road and arrives at the house on the garage side. .An aerial view of the main house in summer. Top right corner, is the covered bridge pictured in a few images below. Bottom right, the long straight dirt road, that’s the dam. So technically that’s the ‘dam road’. Below the middle of the house, in the round stone area, that’s the fire bowl. The sandy looking area on the left of the house is a retaining wall holding back part of the hillside that was removed to make room for the main house. 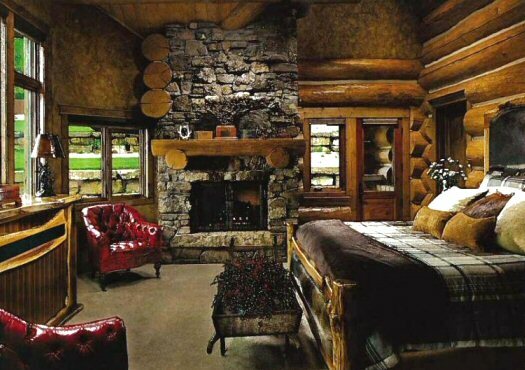 The project for the Log House began in 2008 and construction for the house itself, began in April 2009. The entire project took about 2 years to complete. It’s important to remember that Tony is a bachelor; at least during the time of this construction. 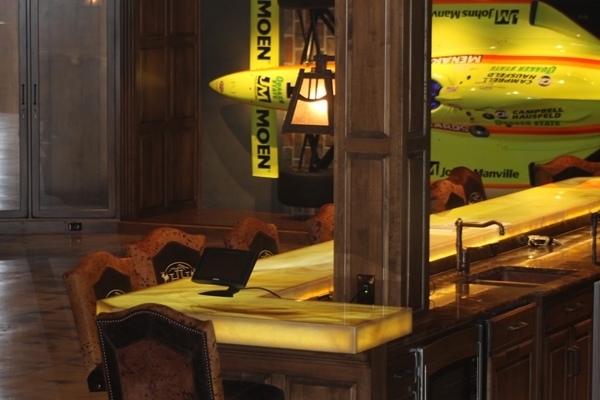 The house therefore is a bachelor’s dream, with a sports bar and race cars hanging on the wall. Along with what seems like a TV in every corner. .Tractor races? 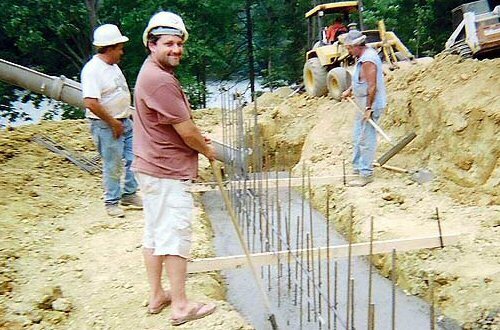 No, that’s Tony helping to dig out the foundation for his new log home. I’m so glad this special moment in cut-offs and flip-flops was captured to mark the moment. 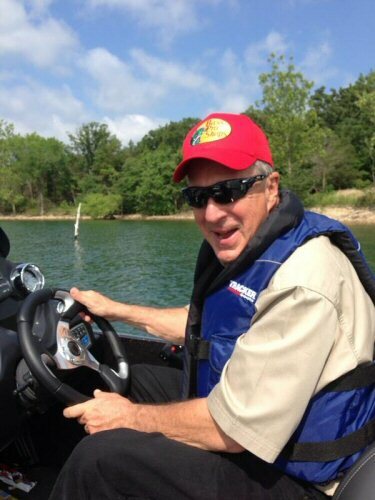 I guess Tony really can drive anything! Tony joined in the construction throughout the project as his schedule would allow. Still laying the foundation and smoothing out the concrete. 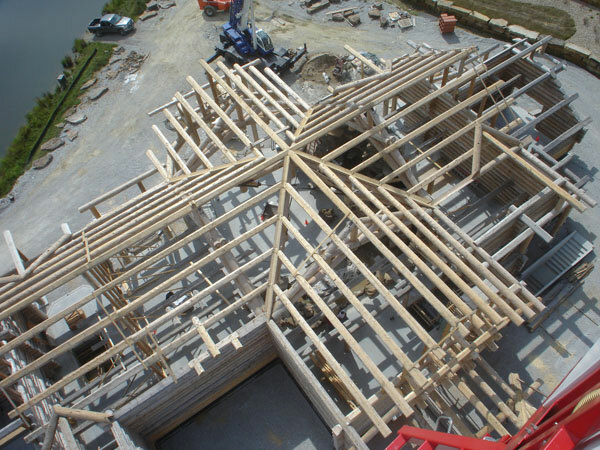 The main effort during the winter was laying in the foundation which looks massive! Well 15,000 sqft is pretty big. 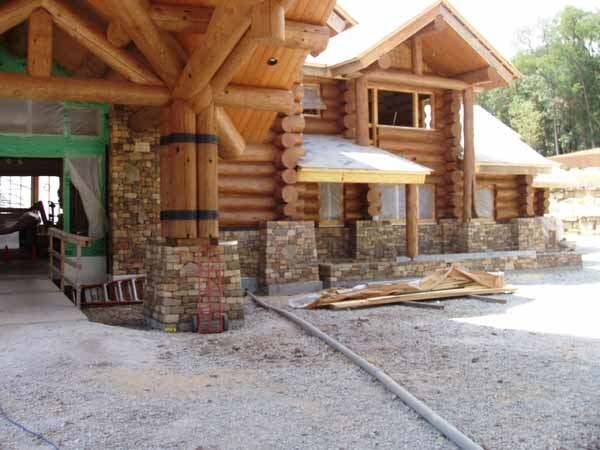 By August the indoor stone work, the aquarium, stream and logs were ready to be laid. . The stream and pond along with a fresh water fish aquarium wraps around the great room to a two-story picture window with a view of the 8-10 acre lake. All of which allow Tony to enjoy his passion for nature year round. By the fall of 2009, what they call the roof stack, started making the home look like something recognizable. This view really makes the house look huge to me. Probably the truck parked by the water’s edge gives it the scale needed to grasp the entirety of the build. By September of 2010 the building began looking like a real house. Ok, a 15,000+ square foot house; but still….a house. The Front Entry in the home is more than inviting, it’s pretty spectacular too. 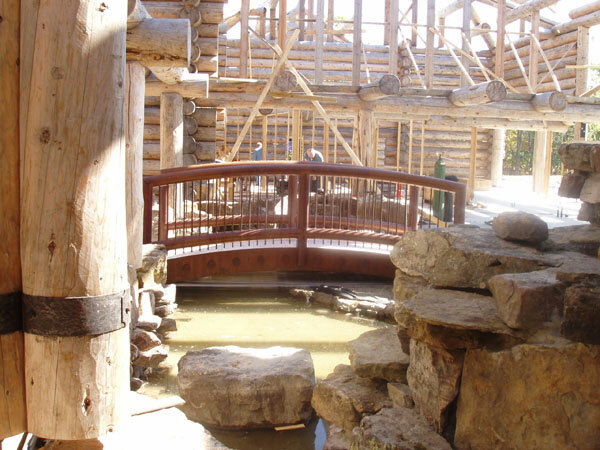 In June 2011 everything was really coming together, including the decorative bridge to the main house. But inside construction was still underway. 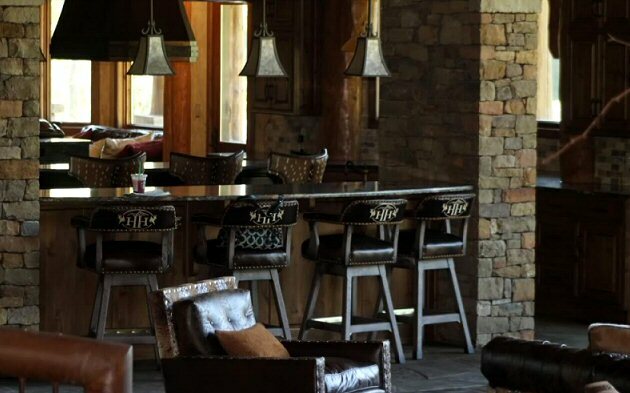 As the main building components were completed Krissy Newman, wife of then Stewart-Haas Racing driver Ryan Newman and close friends to Tony Stewart, began the interior design and decorating of the home. She did a GREAT Job! 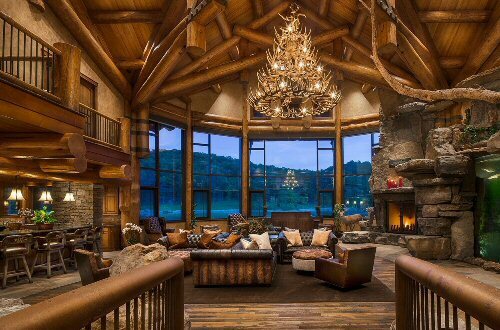 The Great Room over looking Tony’s private lake. On the right side of the Great Room is a beautiful Water Feature complete with running water and the giant fish tank. Reminiscent of the Bass Pro Shops if you ask me. To the left of the fish tank is an inviting fireplace. Another view of the upper half of the water fall. It’s a little hard to tell, but the waterfall starts on the upper level, flows down and turns right into the Great Room. 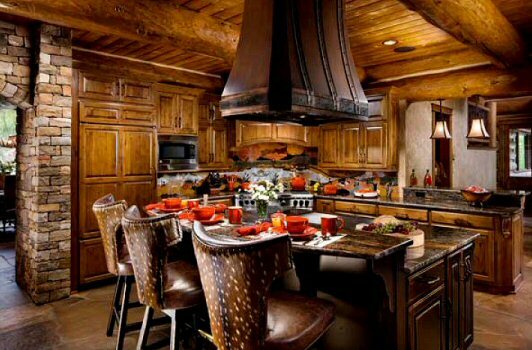 The well equipped kitchen mixes natural materials with upgraded details for convenient functionality. Adding to the openness of the space is a comfortable breakfast bar providing a homey family dining space. The dining room can be both formal and casual as needed. 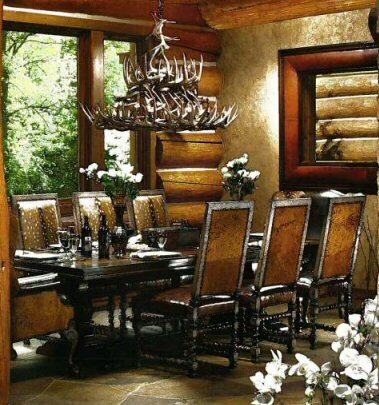 The deep colored furniture enhances the large log walls, windows and antler chandelier. And the stone floor is not only functional, but matches the large stone base of the pillar logs. Hidden Hollow monogrammed bar chairs. 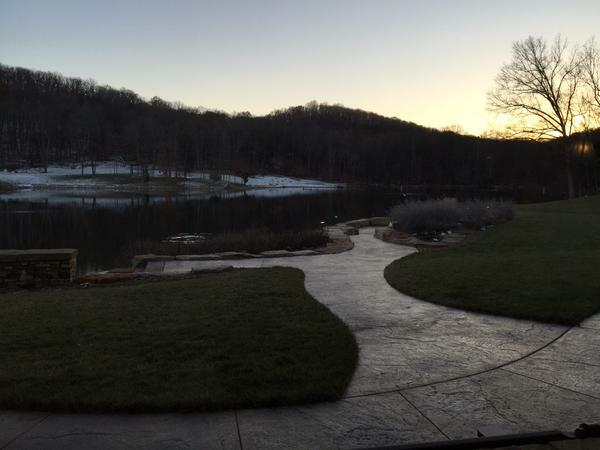 The Master Suite has cathedral ceilings, a warm fireplace and over looks the backyard lake. 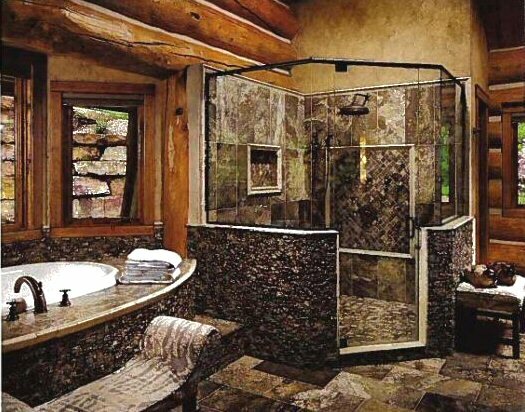 The natural wood and rock features highlight the master bath. There’s no need for blinds because the home is so secluded. The retaining wall outside the windows hold back the remnants of a hillside that was excavated to build the home. 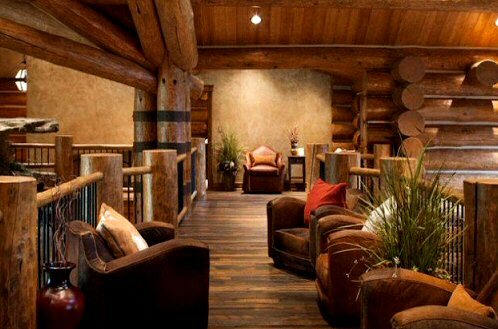 A walkway overlooking the great room provides an intimate sitting area for small groups. Vintage reclaimed flooring adds a rugged character to the sitting area. 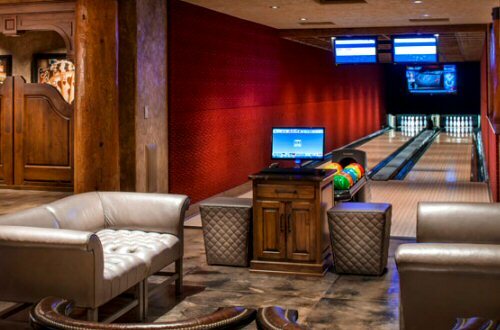 Yes, ever the competitor Tony even has a bowling alley in his game room. The lower level is designed to entertain guests. 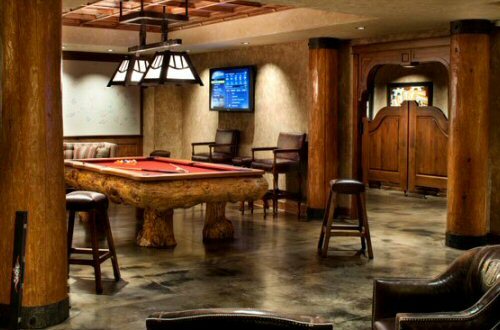 As one descends down the curved log staircase encased by a natural rock wall, they will enter a large room with billiards, shuffle board, and televisions galore. Then there’s the two racing display cases flanking an actual Indy car hung on the wall near the sports bar..
I’m still trying to decide; does the bar light up or is that merely an illusion from the overhanging light features? It’s kewl. And let’s not forget the pool table and saloon doors to add some character to the room.. I like billiards. I’d love to play on that table one day. Tony has entertained sponsors and fans at his home since it’s completion. and it sure looks inviting and warm. The beautiful driveway really highlights the spectacular Front Entry. With this, who needs a garage? Of course that makes me wonder..what is in the garage? Because the house does have a 3 car garage. I know at least one bay houses his orange Lamborghini. 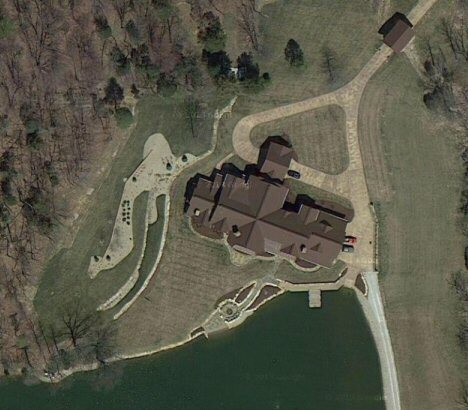 The home reflecting in the lake is the most common image you’ll see of Tony’s Log House. But I kind of like the view from the opposite side of the lake better. What I like to call the yard view. If you didn’t already know, Tony has had an account on Twitter for some time now. 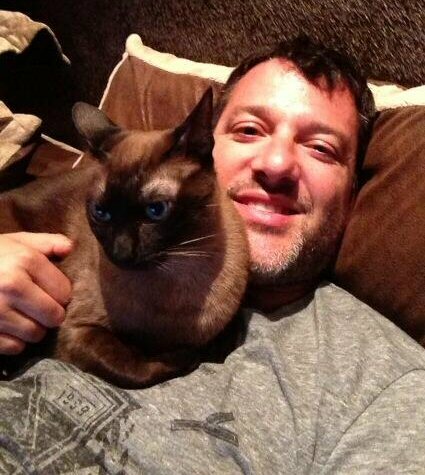 You can find him at twitter.com/TonyStewart. It was established in April 2009. But he never tweeted….until May 2014. 4 days before his 43rd Birthday actually. When his good friend DaleJr kept a promise to use Twitter after winning the 2014 Daytona 500, the pressure was on for Tony to log on too. Which he eventually did. Oh, you can find Junior at twitter.com/DaleJr. 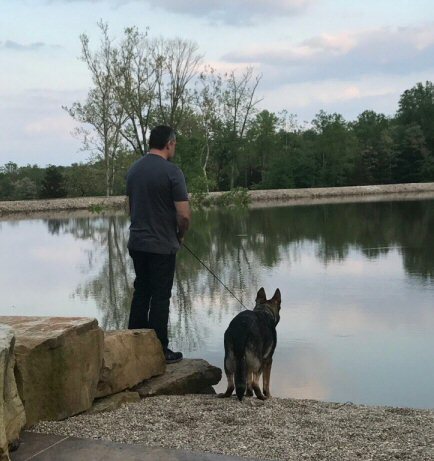 One of the great things about Smoke’s participation in Twitspace are the pictures he shares. My favorites are the special moments he gets at his home and then shares with us. One of my cats, Wyatt, is happy I’m home! 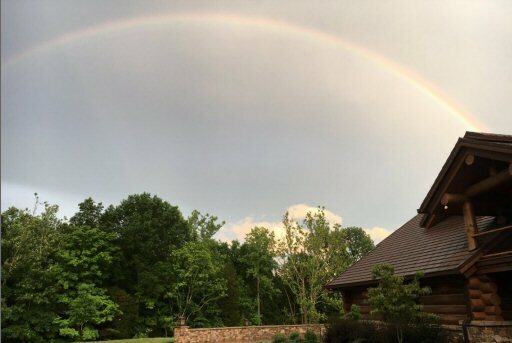 A perfect example of why it’s nice to be home…..even if it’s only for a couple days. 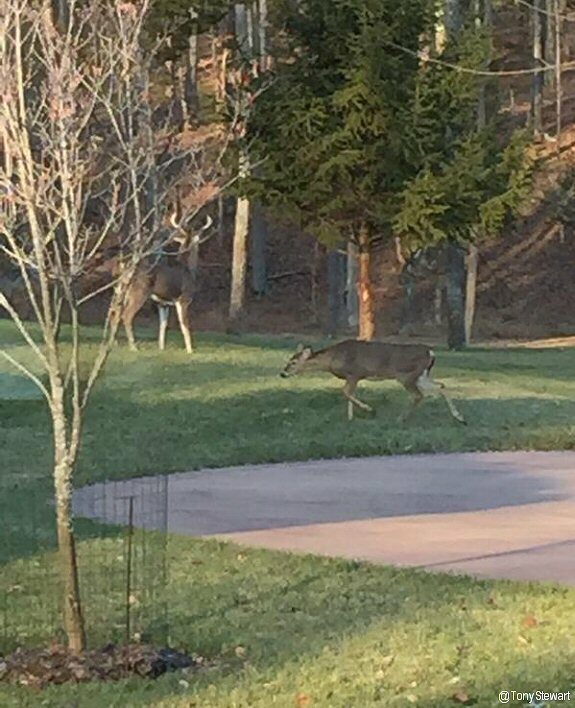 Look carefully there’s a big buck standing in the back ground. 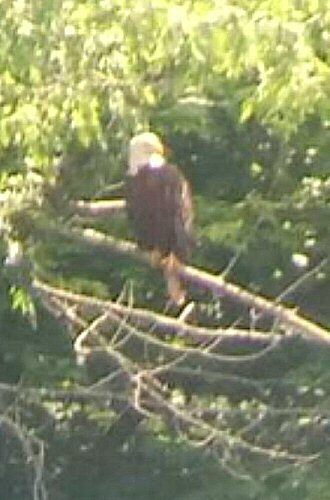 He really blends in with the trees and wooded area. That big fish tank takes some taking care of from time to time. Anyone who has owned even a small fish tank knows this. 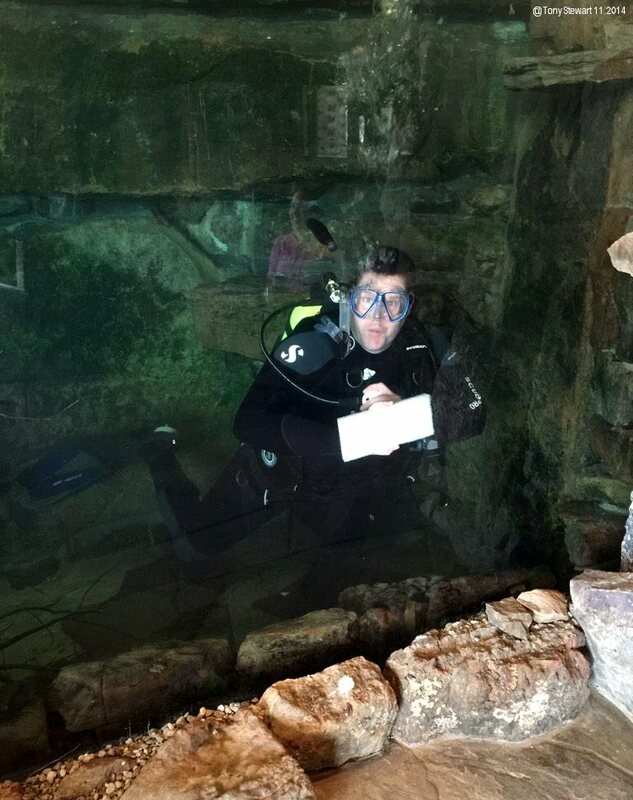 So if you’re planning on having a tank built-in your dream house, make sure you add a little to your budget for cleaning. Just when you think it’s a normal morning at the house, I walk around the corner and see this cleaning the fish tank. Sad that I’m leaving all this tomorrow, but man it’s fun while I’m here. 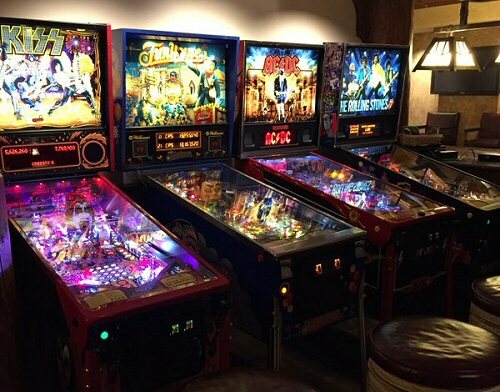 The Last pinball machine is set up finally in my basement. Game on ? 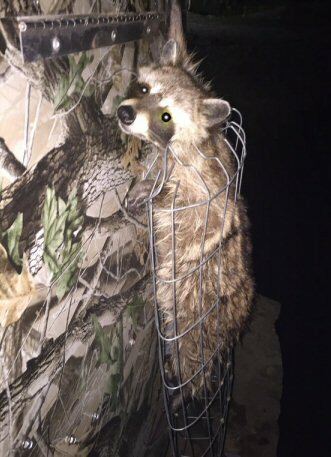 Come home from a bad day at work and see this guy robbing food from the fish feeder? The next day Tony found this critter right back in the fish feeder. He Periscoped the encounter, which is always pretty funny. 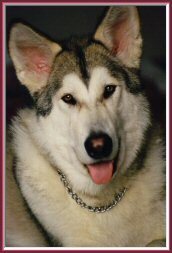 The “guy” turned out to be a girl, a momma at some time in her life. She turned around in that cage and Tony was able to rub her belly. After leaving her alone for a few moments, she got a little help to get out the bottom of the cage and scurried away along the lake’s embankment. On my way to JD Byrider on Shadeland Ave in Indy. 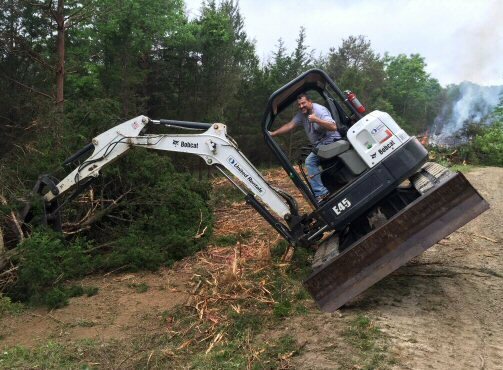 Got a little crazy working on the ranch before I left? 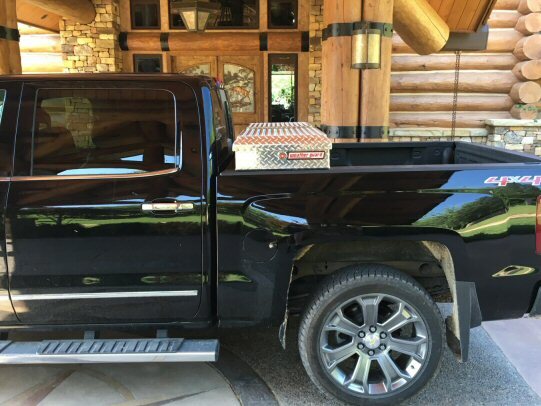 @halshaffer @GZipadelli this is one tough @weather_guard box! Nothing is getting in these boxes. 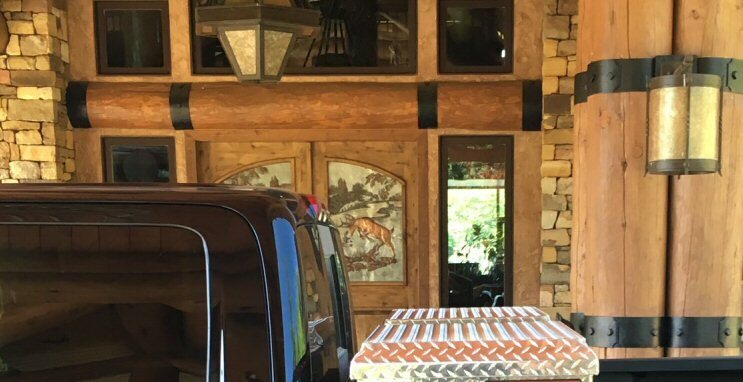 What I like about this picture Tony shared on Twitter today, is that you can see the detail that went into the front doors to the house beyond the Chevy 4×4. Oh and the tool box is nice too. Caught my first fish of the year at the ranch, then caught a big daddy! Tony popped the question and proposed to Penelope Jimenez on November 23, 2017. My god, that is gorgeous! The house isn’t bad either! [Tony] Your home is beautiful. May god bless you and keep you safe. I just love your home! When can I come and visit?? Donna – this isn’t MY home. 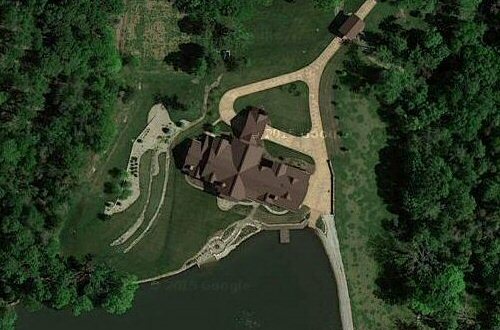 It’s Tony Stewart’s home and you’ll have to contact him at tonystewart.com to find out when you can, if at all, come visit. This isn’t his website. 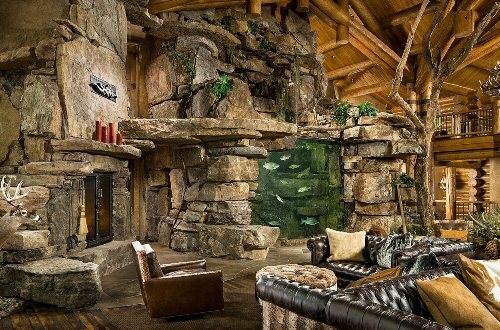 Tony my Mom worked for Bass Pro and I would agree your home looks a lot like a Bass Pro store. She always loved working there because it always felt like she was in the great outdoors all the time. I know John L must love your home too. God Bless you. This isn’t Tony’s blog and it’s very unlikely he’ll ever see your comment. Truly amazing. Wishing you MANY years of happiness, peacefulness, and joy. You truly deserve it. I’m sure if Tony were to ever see your comment on my blog; he’d be grateful for your congratulation. Not so sure about the Brad comment. I always thought my dream was to live on the beach. 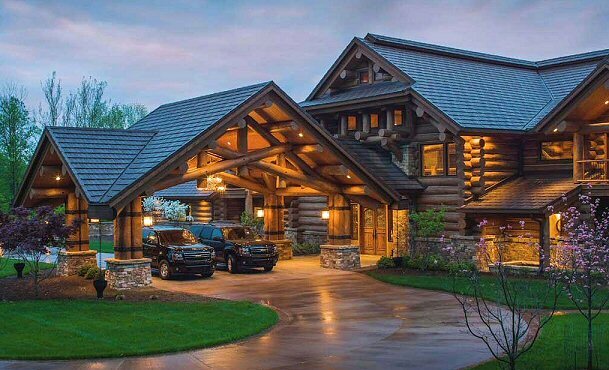 This fabulous ranch has changed my mind…pretty sure I could handle this. I love all the touches of nature and the views. And great job of decorating by Krissie Newman – I had no ideal she was so talented. It is a beautiful home. But it’s 3floors, not a ranch. Tony isn’t going to see your comment. This isn’t his blog. But yes, he has a beautiful place. 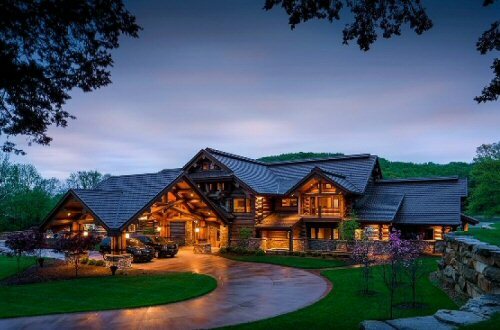 It’s beautiful Tony, a country boy’s dream home. Tony probably isn’t going to see your comment. This isn’t his blog. 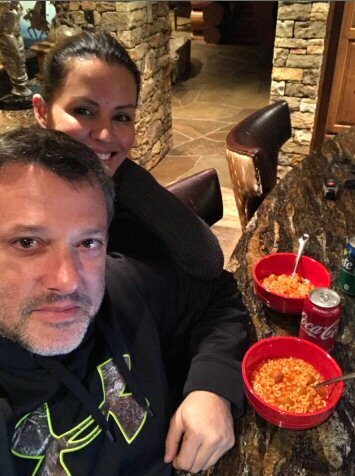 But ok.
You have done a great job describing and photographing the important elements of Tony Stewart’s home. 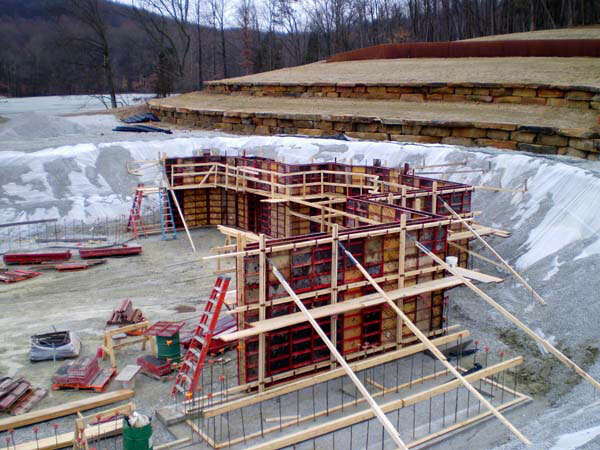 While I lived in Columbus, IN many years and knew about this property he purchased and heard about the home he built, I had not witnessed the completed structure. It was amazing, thanks for posting on your blog! Truth be told, I didn’t take the pics. They have been posted online through various resources. Including Tony himself. Hey 😀 .. thanks for the story .. i’ve wondered what it looked like .. it’s beautiful ! Tony, your home is absolutely gorgeous. I wish my father could be here to see it. He thought the world of you. You were his favorite driver. We were from Columbus. Wishing you many more successful years of racing and wonderful memories in your new home. Tony isn’t going to read your comment. I doubt he even knows my blog exists. But ok. I live just past Tony’s home and if you think these pictures are beautiful, you should see it at night right now, Christmas time. It is lit up to look like a Winter Wonder Land. It takes your breath away! Send me a picture Donna and I’ll add it to the page! Is this Tony’s blog? Haha! Just kidding Springwolf!! 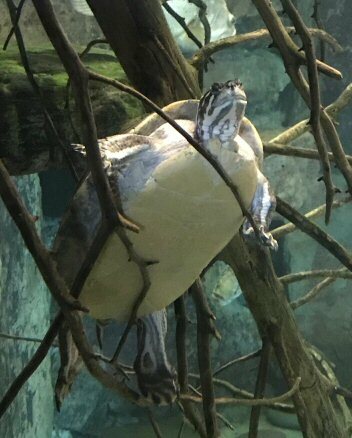 Fabulous. I live close to Columbus, IN and have been by his estate. I put the wrought iron fence in front of the property at the very beginning. the property is beautiful, the home was very nice. now after all the work done its gorgeous. I was lucky enough to see the project go up in the stages. 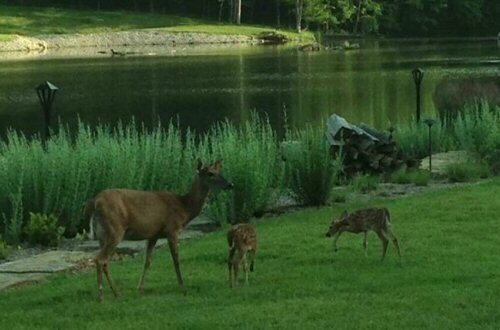 the deer come right up to you. I insulated this home! One memory I’ll never forget. Beautiful Tony, set out some bird feeders. Seen pictures of the dear. Peace at last young man. Hi Tony, I just noticed this web forum. I just watched your last race yesterday (11-20-16). You’ve had a wonderful racing career and it has rewarded you graciously in so many ways. I started following you in your racing career ever since you were about 14 maybe. As well with Jeff Gordon too! I’m able to say this because I live in Plymouth, IN. 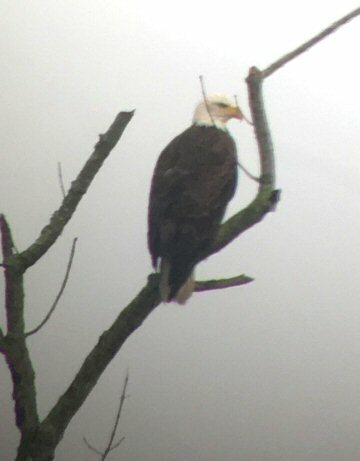 Not far from Columbus! You purchased our local track not long ago. Which, I use to race Late Model there and in New Paris in the 70’s. I’ve been/seen you at Eldora 4 times as well. You’re a man after my own heart my friend; after I retired I was going to build a log home. Never happened – I lost all I had in life from an accident (not my fault). Marriage, home, business and just everything! I became disabled at the age of 39 from this accident! I am 67 now! I was going to be able and retire at/before the age of 50! 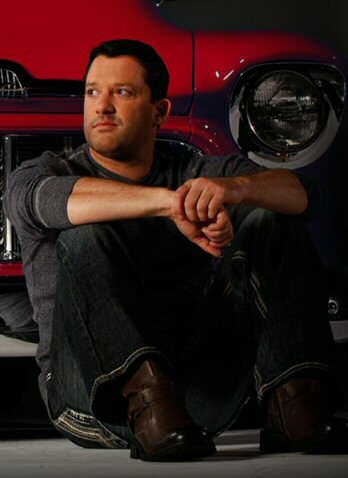 I found it quite interesting and fulfilling watching and following your growing up racing years Tony. Especially so when you hit NASCAR! In 2006 at the Indianapolis Brickyard I was in line to meet you and to get you to sign the 24th scale diecast that I had of your car and I was 2 people away from you and you took one look at me and you had to go from some microphone guy saying something to you. I was in a wheelchair! My loss! God Bless and I wish you nothing but the best throughout your life Tony. You’ve been an inspiration to me! Woild love to send my husband there to fish.